Step by Step Instructions to Making a pleasing and Eye Catching Wind Chime or Suncatcher. Many have found that the right combination of melodic sounds produced by a wind chime go well with many environments. Your sea glass as well as sea shells added to a wind chime makes it pleasing to the eyes as well as to the ears. Shop around for a wind chime that produces a sound you like. Since sea glass is solid, it will not by itself make a real wind "chime" sound. 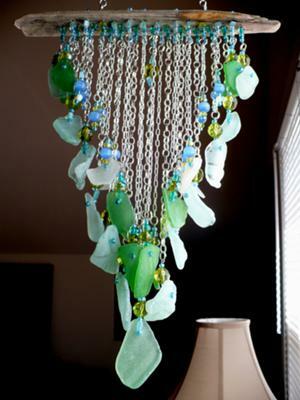 Once you find a wind chime that you like, you can replace some of the strands with sea glass and sea shell strands. To string the sea glass, glue a fold-over bail (see photo) to the top and bottom of each piece of glass. A fold-over Bail Leaf Cabuchon Connector is glued on the top and another at the bottom of each piece of glass to form a loops. Use Loctite Liquid Professional Super Glue to attach the fold-over connectors. Just use a drop. You might want to leave several strands of the chimes themselves next to each other so that they do bump together to produce that pleasing music in a light breeze. If it is not the sound or tone of tubular or other wind chimes that you are looking for, you may decide to make a sun catcher or mobile instead. Just adapt the above instructions for the sea glass wind chimes project to fit your sun catcher or sea glass mobile. 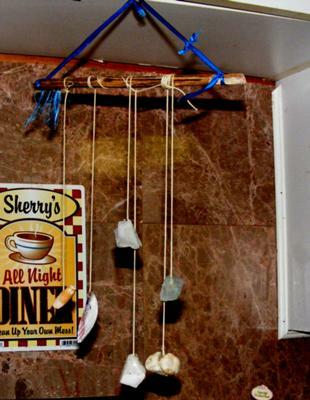 Our viewers have submitted examples of sea glass wind chimes ranging from easy to more difficult wind chimes. Even a very simply-made wind chime of beach glass provides a conversation piece and a nice way to use your beach treasures. Here is a good example of a simple chime from a viewer in Massachussetts. For how this was made, as well as comments from readers, see "From the Sea Chimes." A somewhat more complex but quite easy-to-make sea glass wind chime is this contribution by Loretta from Lake Forest, California. For how this was made, as well as comments from readers, see "Sea Glass Wind Chimes1." Again, Loretta uses sea glass and other objects from the beach and shop to create her attractive chimes. For how this was made, as well as comments from readers, see "Sea Glass Wind Chimes II." 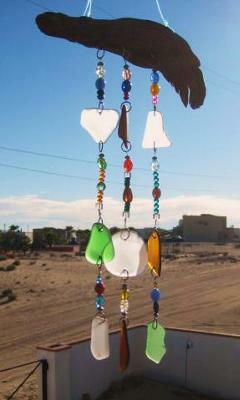 Christine Rogers from Puerto Penasco, Mexico, has contributed several wind chimes made from the beach glass she has found. Christine incorporates fishing tackle, glass beads, driftwood, and other objects in her varied assortment of sea glass crafts and designs. To see her notes on this and other projects, as well as comments from readers, go to "Sea Glass Chimes." Somewhat more complex and very attractive is this sea glass chime or mobile by Jim Conti in Cape May, New Jersey. Take a look at his beautiful contribution and the many comments it received at "Cape May Beach Mobiles." Colorful night lights and light switch plates. 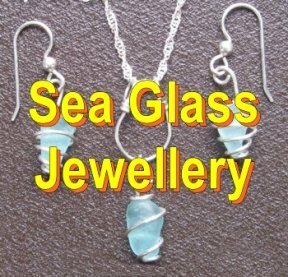 Click here to see crafts submitted by other sea glass fans. Lots of ideas!